The moisture resistant speaker was designed for the demanding marine environment, but is also ideal for use in shower rooms, saunas, bathrooms, and tanning rooms. 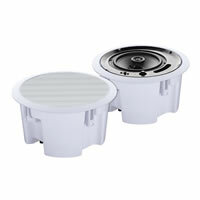 Featuring a 2 way polypropylene coaxial driver with treated fabric surrounds and UV protective housing. Supplied with a cut out template for easy-fit convenience. Priced and sold individually.